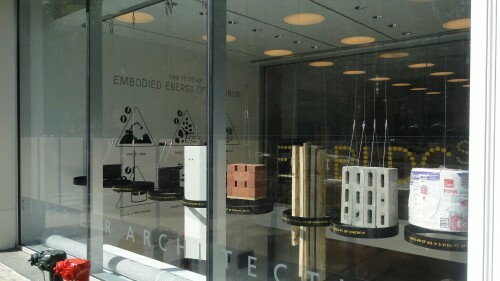 Buildings=Energy exhibit to kickstart Archtober! 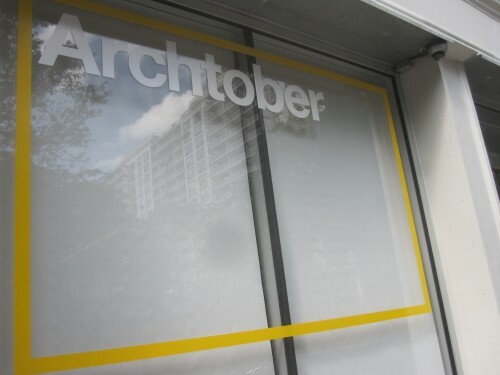 - Archpaper.com Buildings=Energy exhibit to kickstart Archtober! 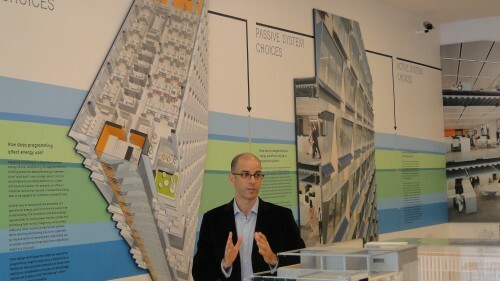 Buildings=Energy exhibit to kickstart Archtober! Anthony Fieldman of Perkins + Will discusses his firm's energy-conscious building design. Courtesy of Center for Architecture. In New York City, buildings account for almost 80 percent of greenhouse gas emissions and 95 percent of electricity use. It was these facts like these that prompted the Center for Architecture to further investigate the urban energy crisis and display the findings–and potential solutions–in an exhibit entitled Buildings=Energy. The exhibit, which opens on the evening of October 1st, explores how important choices made by designers, planners, architects, and building occupants can positively affect energy consumption in our cities. One such example featured in the exhibition is a model building designed by the firm Perkins+Will, whose proposal demonstrates the significance of site planning, materials, programs and their affects on energy costs. For instance, as firm principal Anthony Fieldman explains, tilting the exterior glass by only 10 degrees towards the street prevents a substantial amount of solar heat gains, saving the building on cooling costs throughout the summer months. Various building materials demonstrate energy consumption rates. Courtesy of the Center for Architecture. Other highlights of the exhibit can be viewed from the sidewalk. The attention of passersby on LaGuardia Place will be caught by a display of nine building materials suspended in the Center’s window, each representing the embodied energy of one gallon of oil–just a preview of the striking visuals on view inside. The Center for Architecture’s kick off-event is presented as part of Archtober, the inaugural month-long festival of architecture activities, programs, and exhibitions in New York City.